Zach Braff is living in a dream world. The actor, best known from NBC’s hit comedy, Scrubs, is relishing the success of his first film, Garden State. The movie, which centers around a young actor who returns home to New Jersey from L.A. for his mother’s funeral, stars Natalie Portman, Ian Holm, Peter Sarsgaard and Jean Smart. Garden State got rave reviews at this year’s Sundance Film Festival, and was picked up by two major distributors – Fox Searchlight and Miramax. Inspired by the directing style and creative talent of truly independent directors like Sofia Coppola, Alexander Payne and Todd Haynes, Braff set out to write and direct his own film using the backdrop of New Jersey, where he was born and raised. The origins of Garden State go back to his teenage years, when he began recording anecdotes about his life in the Jersey suburbs. Years later, after having landed the role of J.D. on Scrubs, Braff saw the opportunity to transform his observations into a screenplay which, much to his surprise, has been embraced by the moviemaking community. 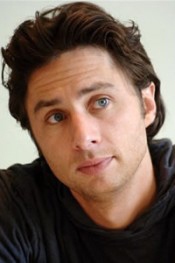 Although he had studied theater and film at Northwestern University, Garden State marks Braff’s first serious, and enviably rewarding attempt at writing and directing. In his effort to make “the kind of movie that I like,” Braff has managed to break away form his identity as simply a comedic actor and begin building a reputation for having a natural talent behind the camera as well. What sparked the idea for Garden State? I wanted to do something really personal. I wanted to do something about New Jersey, a place I was, in fact, born and raised in. I wanted to also do something about going home because that was something I was facing a lot since moving to Los Angeles to pursue acting. I would go back to New Jersey frequently to visit family and friends and I always felt like I was entering a different world going back to New Jersey, compared to the one I was living in, Los Angeles. Over time, I had collected stories and anecdotes about growing up in suburbia. That included stuff I read in the paper, witnessed and things that friends told me. I started weaving them all together and when I did the characters began to form. That was the beginning of Garden State. When did you first begin the journey of writing this screenplay? I started collecting the stories while I was growing up in high school, but I really started hammering out the first draft of the screenplay in 2000. After I got the role on Scrubs, I quit my job waiting tables. Then, I had three or four months before we started filming the show. I am somebody who always likes to keep busy. So, I said myself, “What am I going to do with myself now?” It just came to me that it was the perfect time to do the main thing I have been procrastinating to do — write this script. Over the course of three or four months, I banged out the script for Garden State. How did you go about obtaining financing? Take me through the Garden State casting process. How did you land such a stellar cast of acting talent? When you sit down and cast a movie, you put down your dream list. Most of the time, at the top of the list, there are sort of the icons of everyone who are going to fall on that list. You put down Natalie Portman and then actresses like Natalie Portman because you say to yourselves, “We are not going to get Natalie Portman.” So, you then make a list of ten alternate actresses you think can possibly do it. I did that with every character in Garden State and at the top of the list were Natalie Portman, Peter Sarsgaard and Ian Holm. To my surprise and shock, one by one, they all said, “Yes.” That is really how it happened. Did you ask your cast what attracted them to the script? The script felt different to them. It didn’t feel formulaic. The movie does not follow a traditional three-act structure. I think they responded to the fact that they hadn’t seen characters like these before. Natalie told me that she felt like she was not reading a lot of scripts with strong, young female characters like the one in my script. Were you always planning to direct Garden State? Yes, but I wasn’t always positive that I was going to play the lead. I went to film school at Northwestern and I always thought that this was going to be my feature film debut. But, then, after I got the role in Scrubs and the momentum started to happen, I didn’t want to be pigeonholed as being the “Scrubs guy.” The main character in Garden State is 180 degrees different from what I had been doing as an actor. I felt that playing the lead was a smart thing to do. I felt that I would never have gotten offered this part if I wasn’t involved with the project. Did you feel that your education at Northwestern was valuable in helping you direct this project? I feel my education there was extremely valuable. The best education in filmmaking is to make movies. At Northwestern, I made a lot of movies. I worked on hundreds of movies with my friends and did every crew position possible. That is the best education there is. What it was like for you to direct a movie for the first time? It was crucial to do a lot of pre-production because I was going to be acting in every shot. Pre-production went on for about 10 weeks. We storyboarded every frame of the movie and I included my first assistant director, Michael Lerman, and my cinematographer, Lawrence Sher, in all meetings related to all aspects of production. These were meetings that they would not necessarily have been in if I wasn’t acting in the movie. For me, stemming from my experience as an actor, I realized that the place where time is most lost during a production is in the miscommunication between the director, cinematographer and first assistant director. The three of us were a true team. We planned, planned, planned and there was no aspect left unplanned. How much of you is in the character you created and play, Andrew Largeman? I think there is a lot of me in “Andrew Largeman.” For instance, the things I was brooding about, worrying about and thinking about are all in “Andrew.” For me, it was really speaking to the angst I sort of felt in my mid-twenties and I felt that a lot of people my age were going through. The Sundance experience must have been an incredible ride. It was the dream Sundance experience, the one every filmmaker fantasizes about. You put together a movie and every single person in town passes on it. Then, everyone is bidding on it at Sundance. Harvey Weinstein calls you on your cell phone. It was completely surreal. The movie could have not been better received. People just loved it. It was literally a dream come true. How did you land not one but two distributors, Fox Searchlight and Miramax, for Garden State? We got to a point where there were three companies bidding on it. The most passionate were Fox and Miramax. I am not exactly sure who called who, but either one or both of them thought they might lose it. It was flattering in a way that both of them wanted to be a part of it in some capacity. I think they figured, “Well, instead of losing the film, let’s do it together.” It was pretty unprecedented for both of them, in particular, Miramax. I think Harvey just really liked the film and wanted to be part of it. So, Miramax is going to distribute internationally and Fox is going to do the domestic distribution. How incredible did it feel to direct and star in a movie shot on location in your home state of New Jersey? It was great. There was pressure to shoot in Canada. I bluffed a little and said I definitely would not shoot the film in Canada. It is a movie about coming home and I wanted to express the full experience of coming home to New Jersey. I thought that would play positively into the way I directed and acted in it. Should Kevin Smith be worried? (Laughing) There’s room for a lot of New Jersey filmmakers. What is one of the biggest lessons you learned in directing your first film? The biggest lesson I learned is to not panic. In the end, everything will work itself out. Even when everything is going wrong, you can’t panic. You have to trust that every knot will be untangled by your brilliant crew. You want to surround yourself with people who you admire, look up to and respect. I had a tremendously talented and hard working support staff, which helped me a lot. Things seem to be really falling into place for you professionally. Are you content with your career right now? Yes, I am very lucky. I really feel like I have won the lottery. I have the tremendous fortune to be able to do the TV show for half a year and I really enjoy doing that. Then, I have the other half of the year to do any project I want that I can put together. The positive response to this movie is unlike anything I have ever imagined. I just felt that there weren’t enough of the kind of movies that I like being made right now. So, I set out to make one on my own. The fact that people are responding to it like they are means that there are other people out there who like this kind of movie too. This is great because I’ve got a lot more movies in me to make and, hopefully, I will get a chance to make them. This Article Appeared In MovieMaker Magazine And Was Written By Steven Priggé.